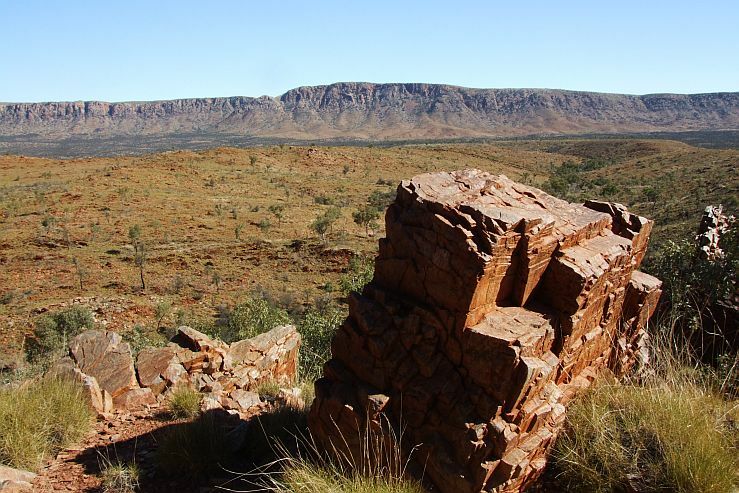 The Larapinta trek traverses from East to West, over 230 km divided in 12 sections, the semi-arid desert and mountainous West Macdonnell national park. 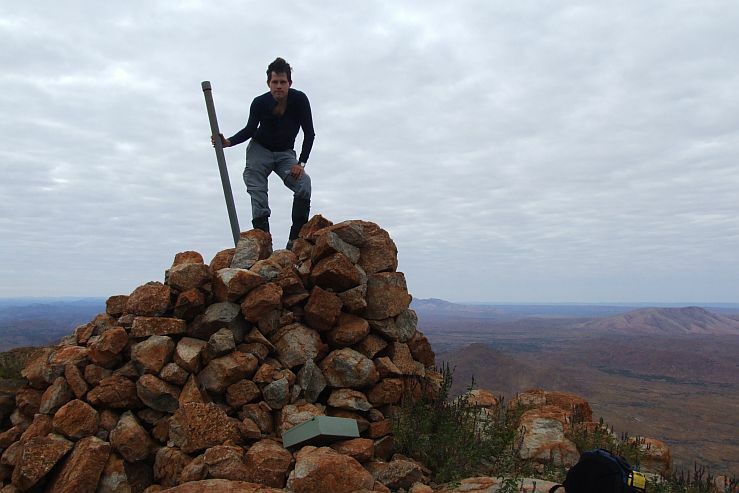 People start from Alice Springs and after 2-3 weeks, the patient walker finish at Mount Sonder, highest point of the trek. From the Sonder's summit, one can see 2 other mountains on the west that are part of the park: Mount Razorback and Mount Zeil. The latter is the highest summit of Australia west of the "Great Dividing Range". 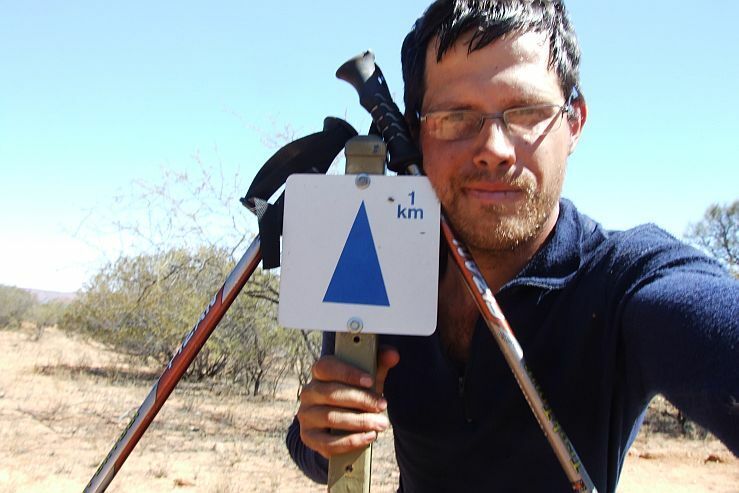 Few hikers climb it every year because it is far from rescue by land, there's no marked track or even maps to climb it, and you need to be granted access by the landowners of the closest road to access the Zeil. My wish is to start from the road North West of the National Park and walk towards Mt Zeil. Then climb it and descend at the Southern side of the Mountain. 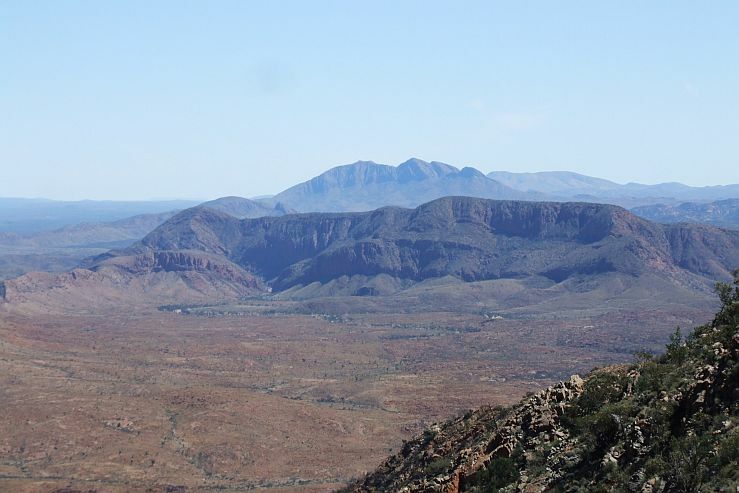 Following this climb, hike across the tropic of Capricorn to reach Mount Razorback which I will ascend and walk towards the end of the official Larapinta trail to climb Mount Sonder. The last part of this walk will be the Larapinta trail to Alice Springs and climb Mount Giles as a side trip. On the track, I will take loads of photos and film the adventure to produce a movie to show the Larapinta trail in all its beauty. The whole trek will be over 300 km. No one tried this crossing before, and certainly not unsupported this means carrying all food. Water is the main issue of the adventure... I must know when to drink it and where to find it. It took me 6 months to prepare the ideal path and content of my backpack. 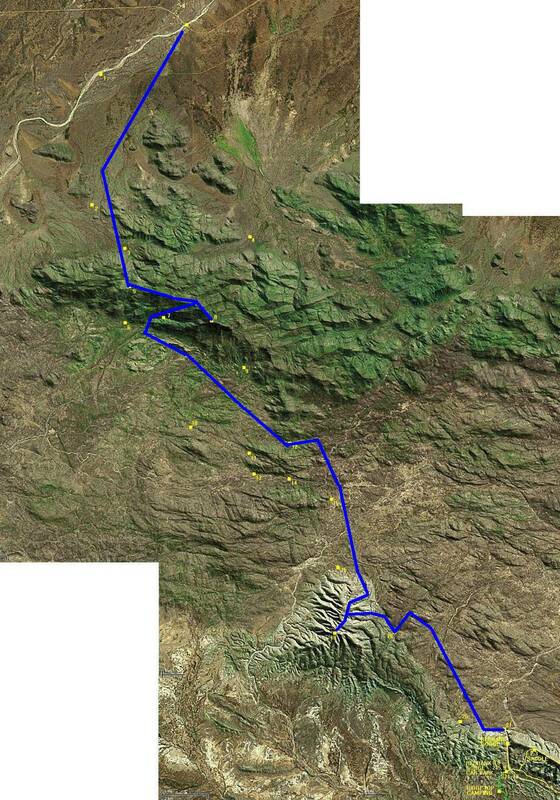 Estimations of time to walk from one point to another was based on hikers who walked the Larapinta or climbed one or several mountains. I believe I can make it in only 12 days with a weight of 35kg at the start including 12 litres of water. The first 3 days I should not find any water as I leave in September, the month of the year with the lowest rainfall. Rain causes the rocks to be too slippery thus dangerous and I also want as much light as possible for the photos. I will ascend Mt Zeil (1531m) by a new route, longer but with a less steep slope to spare pain in my knees. In Sydney, I fill up my backpack with Bondi beach's sand and walk back to the city. I walk 1 hour every day for 2 weeks with 36 kg of sand. I realize why some said it is impossible to walk such a distance in only 12 days. It's too late... Everything is ready, I leave and will try to do the maximum I can. Monday September 4th, 9.30 in the morning a 4 wheel drive leaves Alice Springs. Around midday he drops me off somewhere in the middle of nowhere. I put on my 34 kg gear, take my walking sticks and start walking in this designated area. My adventure finally starts. Straight south. The soil is bright red. The green dots on my satellite photos aren't bushes but trees. The heat is still bearable but my back aches and forces me to take breaks more frequently than I would like. At the end of the day I leave the flats and start my climb towards the top of Mt Zeil. The howling of a dingo echoes over the valley and let my blood run cold. I realize I have underestimated the difficulty of this hike. It soon turns pitch black and I can’t see the top of the mountain anymore, so I have to camp out at the ridge line of Mt Zeil. I wake up early today to reach the top of the mountain before sunrise, but again I have underestimated the difficulty and distance to the top. The road is a labyrinth of stones and rocks where the spinifex (a desert plant full of spikes) rules. When I finally reach the top I feel relieved and happy. The view is breath taking hence the clouds. But no time can be wasted in this environment so I begin my descent of Mt Zeil on the south side and start making my way for the second mountain, Mt Razorback (1274m). I descend into a gorge next to a waterfall and miraculously find a nice puddle of water. I collect the precious liquid. Further along the terrain I find is a chaotic mix of ancient rocks, spinifex and a few ghost gums. Eventually by the end of the day the trail takes me to the bed of a dried up river. Walking through the sand and scattered rocks is tiresome but easier than the zigzag between rocks and spinifex. I run into black bulls who observe me with a watchful eye. I feel uncomfortable with my red backpack! I feel like an outcast in this mountainous land of the outback, and torn by pain. A big dingo comes closer so I scare him away by briskly banging my walking sticks in the air. He might never have seen a human before. Night falls and I feel like crossing a crater but it’s just a grey landscape coloured by the pale moonlight. It allows me to continue without my headlight. I chose my date of departure knowing the cycle of the moon. That night I camp out at the foot of Mt Razorback. The sun is rising and I have already been walking for one hour. I’m too far behind my schedule and I have only a small quantity of water left. The success of my adventure and my survival depends completely on speed now and how fast I can reach the top of Mt Razorback and descend to Red bank gorge. It’s guaranteed to find water in that gorge. I reach the top easily but the descent to Red bank gorge takes longer due to a mistake that left me walking in a wrong canyon gorge. I move straight forward again over a plain full of rocks and spinifex. On arrival at Red bank gorge I immediately find a pond with drinking water. Further on the narrow passage of the gorge is filled with water so I have to construct my own raft. I take some cord, fill up my empty goon bags with air and bind it all together to my self-inflatable mattress. After floating for 15 meters I realized that the gorge wasn’t as gentle as I had imagined it would have been. The water level constantly changes due to the big rocks scattered in the stinky water. This forces me to dismantle the raft and do canyoning along in the ice cold water of the gorge. I have to slide over a couple of rocks and my backpack fills up with water. The weight of the pack doesn’t help, as I try to get onto the rocks to get out of the water. I’m losing energy very, which results in the beginning of hypothermia. The hours lost by the effort of crossing less than 2 km finally brings me to the start of the Larapinta trail. My swimming adventure and miscalculations costs me a day’s delay. Everything is wet: sleeping bag, tent and matches. And the unthinkable: a tiny hole in one drybag has destroyed both my video and still camera. I put the rest of my efforts into drying my clothes so I could warm myself up. But further disaster awaited me. The water had penetrated my spaghetti sachets. They clogged together to form one big spaghetti, which mixed with the fowl (still water) and frogs’ poo is rather an infect chewing gum. It is 10 pm and I boil gumballs but despite the taste I finish all the food. That night I couldn’t find the courage to write in my diary any longer and fall asleep very fast. At sunrise my spirits were low because of my losses the previous day and the delay. With sadness I push my way up to Mt Sonder. The view at the top is stunning but I am left with a bitter taste as I can’t take photos and prove my climb. Luckily there is a “guest book”. On my descent, I tell myself that I didn’t undertake this adventure for the public but for personal reasons. I wanted to see the beauty of this harsh land. All of a sudden, I realize that I have to call the ranger at midday today. The phone booth is situated at the Glen Helen resort. I have to call him before tomorrow midday as they will start a search party if I haven’t called. I walk the whole day till night time and the landscape just passes by as I was in a hurry to make that phone call. It’s 10 pm, exhausted and dehydrated I finally arrive. I call the ranger and have a chat with a couple of campers. They are very impressed and encourage me to continue. I`m at the third of my journey.